I don’t buy bottled water often because of the price. It is always nice to have a few bottles on hand for those days when we are in a pinch and need something healthy to drink on the go. It is nice to be able to reach for Aquafina Flavor Splash for those days! Some of the flavored waters give you a watered down Kool-Aid taste but Aquafina has just the right amount of flavoring for our family. In fact, I turned my back my drink, and my youngest daughter (4), gulped the rest of my drink right down. 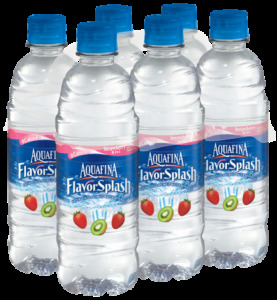 Best of all, Aquafina Flavor Splash gives you that great flavor with no calories, no carbs, no sugar, and low sodium. If you want to try these now, you can print out a $1 off a Aquafina FlavorSplash 6pk coupon right now. 1. Leave a comment on this post on how you like to flavor your water! 2. Become a Facebook “Liker” of BargainBriana and leave me a comment letting me know how you like your water! Please leave a comment for each additional entry. Ends around 5/31/2010 at 11:59 EST. Winner, chose by random.org. Be sure bargainbriana@gmail.com is in your safe sender list as you don’t want to miss the email if you are the chosen winner. If winner doesn’t respond to my email within 48 hours, I will pick another winner. U.S. Entries only. I am a participant in a Mom Central campaign for Aquafina FlavorSplash and have received various FlavorSplash samples to facilitate my participation. Mom Central will send me a gift card at the end of the program. Post was written 100% by me and was not edited by the sponsor. Read more on my Disclosure Policy. I am your friend on facebook as Stephanie Christmann. We buy alot of already flavored water, but we also but the Crystal Lite, and Koolaid, Hawian Punch…and all the other brands out there. I like to flavor my water with raspberry. .-= Mami2jcn´s last blog ..Huggies MomInspired =-. Also, I like to flavor my water by adding powder mix ins. I’m a Facebook Fan and left a message on wall. I like to flavor my water with Crystal Light mix-ins. i normally just drink it straight up. but sometimes its good with a lemon in it. .-= sarah buki´s last blog ..Enter to win Playtex =-. I don’t flavor my water but I do love flavored water! I love Crystal Light. I carry it with me everywhere so I can flavor my water on the go! Yum! I love to put cucumber in water! I prefer flavored water because my youngsters do. If water is flavored, they drink more of it. I love the taste of plain water. No flavoring needed. I rarely flavor my water but if I do it is straight lemon – nothing else. I love to add fruits to my water, like watermelon, strawberries, and cucumber! I am a Facebook “liker” of BargainBriana and I love my water ice cold with a slice of fresh lemon! I love to flavor my water with fresh lemon or lime. It is very refreshing! I don’t usually flavor my water, but on occasion, I do add a slice of lemon. Thanks! Carol P Dziuba Facebook “Liker” of BargainBriana and left a comment letting you know how I like my water! I like my water flavored with fruit, like strawberry or citrus. I squeeze a little lemon in my water! .-= Jennifer´s last blog ..Free 6-Month ReadyMade Magazine Subscription! =-. Mmm my hubby and I love the Lemon. Even though its not as healthy, I make koolaid. Thats my version of flavored water! .-= Princess Christy´s last blog ..The Truth =-. I’m a Facebook “Liker”and left you a comment letting you know how I like my water. I use lemons to flavor my water. I hope to win. I love my water to have flavor. My fav is any kind with kiwi or grape. I am a facebook liker, under mskmt13@mail.com, I prefer you use mturner0116@yahoo.com. I so hope to win!!! I like to naturally flavor my water with green grapes. It’s a little different, but I like the sour/sweet juice that comes from the green grapes. Sometimes I even drop a few grapes whole in my glass of water. Also, a squeeze of lemon or lime are preferred methods of flavoring my water. Facebook fan! I like my water cold w/lemon. a Facebook “Liker” of BargainBriana! I love Crystal Light Peach Tea in water! I like to add a little lemon juice in my water. .-= The Happy Wife/Danielle´s last blog ..Win a Bra Makeover =-. .-= LaVonne´s last blog ..Police, Open Up! =-. I like to use the packets of peach ice tea that walmart makes. I bring them to restaurants even. I like to use Crystal Light. I stock up when there is a good sale & coupons. I like sugar free kool aid. .-= Sandra´s last blog ..5 things on my ‘Honey-do’ list that never get done =-. I usually dring plain water, but if I have some, I will add lemon. Occasionally I use crystal light too. I like you on FB and will leave a comment there. I love to flavor my water with lemon. I use powder mixes to flavor my water! .-= Rhonda´s last blog ..20% off Coupon at Hollister =-. I love WalMart’s brand of Crystal Light!!! We make pitchers of it (our favorite is cherry limeade)!!! I like to flavor my water with fresh lime. I’m simple- lemon wedge, please. I like plain water – room temperature! I usually do not flavor my water but when i do, i flavor it with either crystal light packets or wylers sugar free pink lemonade or sugar free hawiian punch grape flavored packets. 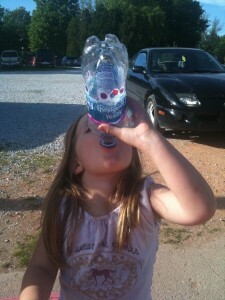 My family Loves the Aquafina grape flavored water though too when i buy it. My oldest son has sensory processing disorder and loves all of his food and beverages flavored. I CANNOT get him to drink water unless it is flavored! He does enjoy the Aquafina flavored water and it also keeps him hydrated! When I am out and about I have Crystal Light On-The-Go packets in my purse. I just found a new Crustal Light flavor we love to use in our water. The Cherry Pomegranate is delicious. The Aquafina flavored waters are good too! Thanks for a chance to win some! I normally just use lemon and lime to flavor my water at home. Lots of ice and some lemon slices, perfect! I like to drink sparkling water with fruit juice. Crystal Light is so expensive, but I find Wyler’s at Walgreen’s and Mondo at Dollar Tree. They are just as good, but only $1! I also like Food World/Bruno’s brand, it’s very tasty. I’m not a fan of regular water :) Thanks! I don’t flavor my water, but I would love to try it. Maybe I would drink more! Lemon is definitely my favorite flavor to add to water. I would love to win these. We need a healthy lifestyle change. I like Bargain Briana on FB and I left a message. My favorite is to add lemon to my water, sometimes I add cucumbers. I normally drink my water plain–just really cold. When I’m wanting some flavor, I will put a Crystal Light Pure Fitness in my water. I don’t usually flavor my water unless I’m making ice tea! I love to flavor my water. In fact this is how I gave up soda!! I use Crystal Light and Mix-Ins from Weight Watchers. I like the pink lemonade powdered mix-ins. Looking forward to trying “preflavored” water. I like to put limes or lemons in water… a nice little touch. .-= Kindra´s last blog ..Saturday Events: $1 Flip Flops & Free Ice Cream! =-. I don’t flavor the water I drink at home but I do buy flavored water. Lemon is my favorite. I like to just throw a lemon slice in my water. I don’t usually flavor my water, but when I do it is with a little lemon. Sometimes I’ll pour just a bit of fruit juice in m water for a little flavor. Posted to FN and entered that I love lemon in my water!! I should have posted it first! The Citrus Twist looks so refreshing! When we’re not swilling iced tea by the pitcherfuls, we often use Crystal Light to flavor bottled water. But I’ve tried the flavoried Aquafina waters and do like them too! .-= Rob O.´s last blog ..The iPad is Dolphin Safe =-. I don’t flavor my water, but I sure love flavored water, when I splurge on it!